I'm agendercadence, aka Meep! I heard about this forum through the Tumblr MLP collection community (where I have an account under the same screen name as here), and I thought it would be fun to finally sign up here! I've been collecting MLP since I was a small child, and my first generation was G3! I hope I can make some new MLP friends here! Oh hi, I've seen you around tumblr. I'm not the most active forum member but welcome! Hi welcome to the tp , we will have a lot of fun. Hi! 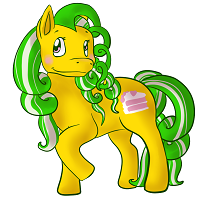 I love your minty profile photo! Welcome to the MLPTP I hope you enjoy this forum. It is full of friendly pony people. We are glad you joined us. Welcome to the TP! Happy pony hunting! Hullo and welcome! I love da Minty too, she's one of my faves.